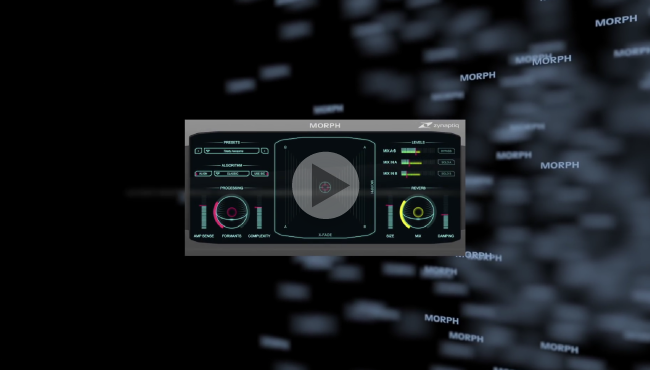 MORPH 2 is a real-time plug-in for structural audio morphing, the sonic equivalent of one object slowly changing its shape to become a different object - for example, one face becoming another. Super-charged with a selection of 5 different morphing algorithms, a stunningly clean formant shifter as well as a lush reverb that seems to extend sounds much like some highly revered vintage hardware boxes, MORPH 2 opens up a whole new universe of sounds to explore. Create seamless morphing transitions, new hybrid sounds that combine aspects of existing ones, physically impossible instruments, the furthest-out creature and robot voices, talkbox-esque effects and other outrageously unique new sounds. Whether you're a sound designer for film or games looking for that signature sound, or a music producer or remix artist wanting to create new content from existing recordings...look no further, MORPH is for you! MORPH takes two input signals, A and B, and creates a new sound or transition that has characteristics of both – like a circle gradually turning into a square. Singing guitars, dogs that speak, or cymbals made out of mains hum - the choices are endless. MORPH computes two separate morphing transitions from A and B simultaneously, one starting out at A and shaping it to become B, the other starting out at B and shaping it to become A. The two sound completely different. A Whole New Universe Of Sounds. A Multi-Verse, Actually. Speaking of the MORPH 2 formant shifter...it is – quite simply – stunningly good. Whether you use it on voice, drums, instruments or SFX captured in the field – it always sounds natural and focused, preserving all your sound's detail, without introducing any of the granular or "spectral blurring" artifacts associated with traditional approaches to formant shifting. If you're reading this, most likely you are a discerning audio connoisseur, and thus most likely you'll fall in love with the MORPH 2 formant shifter the first time you hear it! If you have purchased MORPH AU on or after October 1st, 2014, you'll get a free upgrade to version 2. If you have purchased MORPH AU from us or Prosoniq before October 1st, you can upgrade to version 2 for USD 89 / EUR 99 (incl. 19% VAT). For a limited time: If you have a license for a legacy Prosoniq Morph version, such as the discontinued MORPH VST or MORPH RTAS, you can upgrade to Zynaptiq MORPH 2.0 for USD 89 / EUR 99 (incl. 19% VAT). To perform the free upgrade, please send us an email with your activation code and we'll reply with a new code. To perform the paid upgrade, purchase the upgrade version from your favorite re-seller, who will supply information on how to perform the upgrade. Please note that you will be required to supply a valid existing (old) serial number!